There are a few museum maps that come with GTKradiant, this includes q3dm1, q3dm7, and q3dm17, if you have trouble accessing those. I might be able to help. But they come with GTKradiant 1.6.4. Once I get my current map released, I will be testing your code to convert my AEpyra map that should yield some interesting real-world test feedback. common/hintskip   // Advanced hinting shader, these sides to not hint. I was thinking of triggers, but this is less trivial since in Q3A they are just "trigger" brushes, whereas in Reflex they are two separate textures i.e. for the JP and the TP. About clipping... player clip, weapon clip, bot clip... probably delete the latter two for now. Player clip is an issue, since you need to move Reflex clip away from the walls, whereas Q3A clip will go right through everything without a problem. But if you can convert player clip to Reflex clip that would help... might be nifty to have an option to turn that off though. Maybe add an option in the above config? Hint brushes... deleted automatically, since they are of no use to the Reflex engine. Anyway, if you need help sorting out something I'll try to help. BTW... do e.g. 8-sided cylinders actually work as brushes in Reflex? Because that would be geometry imported that cannot actually be created in Reflex. If the brush is a "trigger_push" it is a JP or AP. Converting the targets should also be possible. If "common/trigger" is in ""trigger_teleport" class replace texture with... just noted Reflex TP has no texture at all, it uses an empty texture. If interested I could add the player spawn, ammo, weapon spawns and other items (health, armour) as well. Presently replace all with the same "PlayerSpawn" in Reflex. I did a quick map convert of q3dm7sample.map, according to the Reflex spawn entity and any weapon entity, the position data, in the entity box seems to be x,z,y or y,z,x (cannot properly tell)... Anyway the converted map is mirrored in the third coordinate. And boy do we need a way to ignore clipping and hint brushes. Then again I should not be so lazy and edit out all the "junk" in GTKradiant before converting... should follow my own advice. Sorry about that. lol I know right. I converted my map with the new clipping swapped in and holy god everything is plastered with noclip. I mean every single wall. I can't remember if I did that or the engine. Entire map is orange now covered in noclip lol. If I did that way back then I put a ton of work into clipping and caulking. It's everywhere. No wonder I gave up on Q3 mapping it was insanity. I'll upload a screenshot later, you'll recoil in horror. Awesome effort finding all those entity replacements. Keep going. This is all excellent stuff that's going to help Chronokun make his converter even better. We'll probably get weaponclip someday but for the meantime replacing it with noclip should be ok. Can't imagine maps will have a ton of weaponclips so replacing those manually shouldn't be much effort. Replacing nodraw with nolight can be a problem but again it's minimal use shouldn't be a problem. Replacing caulk with nolight however can be a problem because caulk was invisible in Q3 and nolight is not. You're likely to have a some caulk sticking out visibly now. This is a minor issue in the grand scheme of things. As long as all the major brush work is there then reworking minor details like caulk sticking out seems like small potatoes. It is possible to build a perfect lightmap without caulk in Reflex. I'm sooooo happy that Reflex has basically done away with the need for caulk. That was one of the major issues with Q3 mapping that frustrated people to no end. As long as you use nolight on every face of a non-visible brush and you have good brush work it is possible to make a leak free map without much effort and caulk is completely unnecessary. Quake 3 (perhaps I should say radiant specifically) on the other hand always struggled with leaks to the point people came up with wild caulk techniques to help prevent leaks. One of the best tools to help new mappers prevent leaks is mind boggling simple, dev_grid texture. Instant win. Chronokun is it possible to make a GUI for the converter? Perhaps file browse to select instead of command line. I mean I can do command line no problem but everyone might not be as adept in command line. It was obvious from your instructions and inferred that the exe had to be in the same directory as the map file but not everyone might not have understood that. At least temporarily recommend you go back and add that instruction to your op. The entities are all in AEdm7... so I can easily look them up. Though for the entities I might need to look into id's museum map... it contains one of everything. I noted that I use Q3A nodraw with all my decals, i.e. on all the other faces on the brush... so using darkcaulk might not be too great. I guess there are some things one needs to manually fix in Radiant first. Hmmm you could replace it with noclip instead temporarily in some circumstances. In other circumstances you would want to use nolight. Not having perfect equivalents throws a slight wrench into the mix. Have to get creative with manual fixes. be a little bit more thankful, i'm pretty sure chronokun is doing this on his freetime. I hope the mirroring issue can be fixed, or I might have to look into mirroring the map in GTKradiant first, though I have to admit that I am less than enthused to do it... rotation and mirror work most of the time but for a whole map... tends to mess up entities IIRC. But there was a CTF tool, MiriX, that let you mirror without that issue. Might need to try that. I may add one but I don't think I will be adding scripted texture replacement since that could be just as easily scripted separately. Mirroring issue I will fix. N-sided brushes... I think I saw a screenshot of those working? Didn't test myself. UT/Other game converters - I don't really see much value in that personally so it's not something I will work on. Anyway I appreciate the suggestions and feedback but naturally some things are going to be lower priorities and I think being able to use external tools for burshwork is the most tangible benefit right now so I'm wondering if a ReflexToQ3 converter might be more useful than some of these other features? In what universe did any of that come off as not thankful? Pretty sure I made it extremely clear that his efforts are extremely appreciated. Sounds like you just want to gnitpick at every word I say and take it out of context. Been getting a lot of that around here and it's really getting on my nerves. I couldn't be more thankful unless I dropped to my knees and started sucking on his robotic reflex jockstrap. I saw an 8-sided column in q3dm7, left and right of the lava pit with the gargoyles above. Was a really cool moment to see that in Reflex. "I'm wondering if a ReflexToQ3 converter might be more useful than some of these other features?" I actually had completely over read the implications of that. That would be pretty awesome. Only slight issue I would see with that would be the back and forth of the entities, and losing such information. Strictly from the geometry, if I understand it correctly, it would work well? There are several programmers at the Quake3World forum that might be willing to create a Reflex module letting us edit with Reflex resources in GTKradiant... I have not looked into how difficult this would be but it could be an option. Any work you decide to do is appreciated. Here are some prisms for mappers that would like to use them. I've already begun replacing some of my brushwork (in my latest map) with these N-sided brushes. Just copy/paste the brush/vertices code from this .map file into your .map file. NOTE: Don't paste them at the very end of your .map. Paste them right before the first Entity line you see, near the bottom of your map. If you have a lot of entities, then it won't be quite at the bottom of your map, but probably half-way point. No you don't need account to download. I had to go make one after seeing Chronokun use it because forums have max size of 140KB. Honestly dropbox is good though. Just started using it last night. It's basically run like tortoise cvs or a private domain shared folder (in real time). Have to run a program and background service for it to work. Since the ul limit on this forum is so small you'll have to use something like dropbox instead if you want to share files. ReflexFiles is only for completed stuff not just stuff we're messing around with so dropbox does a nice job of it, can recommend. Yeah I pretty quickly ran out of forum upload space just from maps and screenshots, then I switched to some other file hosting site that didn't require signup until I realized the files were getting deleted after a few days so I figured I'd try dropbox since I saw it recommended somewhere else on the forum and it seems to be working out well. Of course the code is also on github but since not everyone has a compiler or knows how to use it dumping the compiled executables on dropbox solves that problem. Also don't worry, I didn't take anything you or anyone else said as demanding or unappreciative, any suggestions made I'm perfectly capable of choosing whether or not to ignore them. BTW... did the texture fields in Reflex have texture scaling fields already (offset and rotation I recall)? I ask because then a GTKradiant texture "fit" might make it into Reflex as well. Not sure its actually possible though... just wondering. They are copied across, but I'm not sure if there's any kind of coordinate transforms or anything I need to do there so they may or may not be correct. you can upload releases to github if you want to dodge dropbox. I finally made GTKradiant use W,A,S,D keys in the camera view (after something like 10 years)... but a quick edit of q3dm7sample.map using "select face" and the "select all of the same" via shift+a let me very quickly remove all clipping, portals, and the skybox and other junk like that. I wanted to post a screenshot. Alas not happening on this forum, I am at my quota limit . To make it short... you fixed the mirror issue... looks great. Thank you for fixing it. It also shows just how sloppy the brushwork in the sample is. Us later mappers probably overdid the brush neatness, but we felt it had to be done. Almost no caulk is being used because the map is almost completely made up of structural brushes, here the face culling happens automatically. Never understood why it was not done the same way for detail brushes, but only detail brush-work actually really needed manual caulk to remove the unseen faces getting rendered by the engine. IIRC, there was some option to have the compiler (q3map2) approximate patches using brushes, e.g. a curved wall. This would create nice "rounded" areas using normal brushes. And your conversion tool would make that look amazing. Quite unseen in Reflex up to now. Alas, that would require a bsp to map conversion loosing any brushwork detail. I'll check what was up with that. But brush approximated patches would certainly look nice. Dropbox: No idea what the issue was yesterday. Downloading works without an account so no problem there. Note: The third position column in entities under Reflex, according to GTKradiant coordinates is x, so the box position is y, z, x (from left to right)... very unusual. You must have had a bonny time figuring that out. I have some code that does that but it's kinda messy atm, I guess I can add it to the converter until reflex gets it's own support for patches. right on the ball I see... found those only just now. Never used them much. common/clip is probably left in for now? Since it actually can be replaced with Reflex "clip"... even though both clips are quite different. In Reflex we really have to keep every clip brush away from walls... not so wonderful. I hope the devs will have mercy and turn off clip "lighting" at some point. looks very nifty the patch conversion... non-trivial I would imagine... I like those tubes. Hopefully not many folks will use q3a maps... since that could lead to a flood of maps that required no skill whatsoever to create in Reflex. 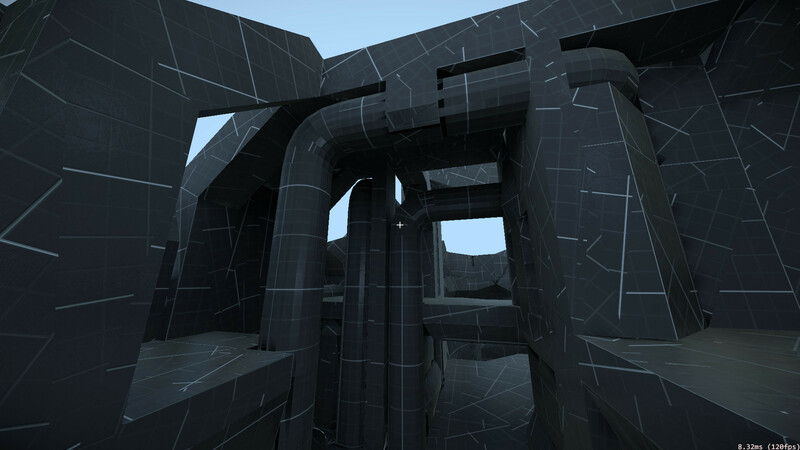 I am looking forward to converting my AEpyra map though... for future instagib .